So as you all may know, I recently rescued a precious little baby leo and she sadly just couldn't fight any longer Now that she is in a better place, I have been thinking about what to do with her tank and all of her things. I was originally to sad to get another and was looking for a reptile place to donate her things too, but after some encouragement from GU's wonderful members, I finally decided that after everything was disinfected, I would very much enjoy taking in another little one. (Am I making sense at all?) I also thought it would be fun to maybe get an African Fat-Tailed Gecko, because I think my other leo (Fig) is all the leopard gecko I need right now I have done a lot of research and I think I have the care part down for the most part, and the rest is just some ideas on tank my tank build. I have read that the AFT's care is very similar to the Leopard gecko's care, except for the one big thing is they prefer their humidity at 50% - 70%. 1. Since their care is so similar to a leo's, would the same feeding schedule that Elizabeth gave me for Fig be appropiate for the AFT, or something else? 2. All the care sheets I have read say to keep them in a 10 gallon, but there isn't anything wrong with the 20L, is there? 3. My big question is I was planning to use Zoo med's excavator clay for the tank, but after a lot of reviews, I decided that my biggest problem is going to be that it crumbles. Any tips? I could always just cut some styrofoam. Thank you all so so much for reading, have a great day! I really like AFT's! A 20 gallon long is fine for them. The same feeding schedule is fine. Note that most AFT's don't like worms and prefer crickets or roaches. I use eco-earth (coco fiber) as a substrate. I mist them every morning. I'm happy you're branching out, LeopardGecc! An AFT will love all the space a 20 long provides. Thanks you guys! Good the 20L works. I can do crickets and roaches, and I still have another half a bag of Eco earth from when I did my leo's tank. Thanks again! Alright! I've done some more research and pretty much decided that excavator clay just doesn't seem like a good idea. I was also reading on some different sites and they all say different things on temps. The majority of them say to keep them at the same temperatures as leos. Is that okay? Thanks! In my opinion and experience, same temps as leos is fine. Does anyone know of any good breeders or sites to read on? I have been looking around for a place. If possible, I would love to rescue/adopt another little one, but I can't seem to find any sort of reptile rescue. Thank you all so much! 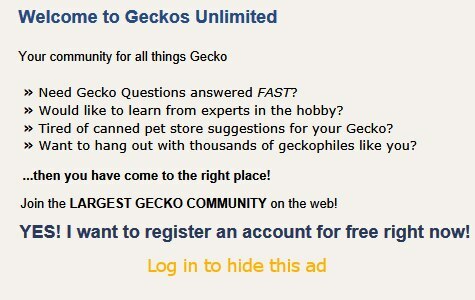 Good wishes finding your "next" gecko, LeopardGecc! Lauren O'Brian runs The Gecko Sanctuary somewhere in Massachusetts. Try contacting her. FB's Joe Hupp may breed AFTs or know someone who does. Looks like this one may be closer to you? My only problem is, I sometimes feel guilty when buying from a breeder (There is nothing wrong with them at all, this is just my opinion), thinking of all the homeless pets. I would so love to save a life, I just don't think I could handle it if another gecko died in my care. So I would love to adopt, but I would be so paranoid. And Pie, the leo I got from PetSmart looked perfectly healthy and even got over her illness, and then a genetic defect popped up and killed her. But then I think, a perfectly healthy gecko from a wonderful breeder could have a genetic defect pop up out of the blue, You just can't tell. I just don't know what to do at this point. Am I making sense? Thanks again for reading, guys. I am also completely terrified for my other female (Fig) now. I feel like rushing her to the vet every time she does something out of the ordinary. And I know that's silly, I'm just so paranoid after my other leo. Last edited by LeopardGecc; 08-30-2018 at 06:21 PM.